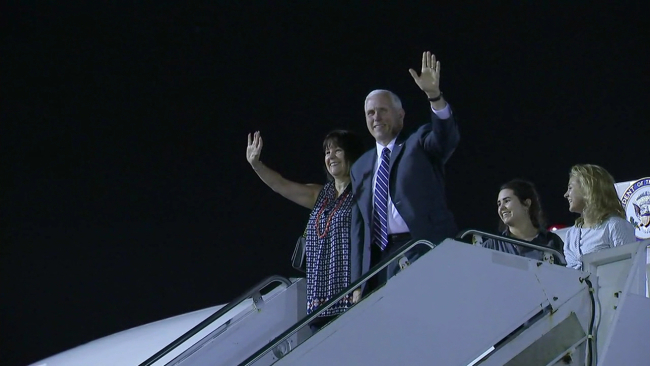 Vice President Mike Pence and his family late Sunday evening arrived on Oahu, where he will spend most of his short visit with military personnel. KHON2. Vice President Mike Pence is on Oahu for a short visit before going back to Washington, D.C., concluding his 10-day, four-nation tour of the Asia-Pacific region. Hawaii News Now. Vice President Mike Pence is making a shortened visit to Hawaii today before heading back to Washington, D.C., ahead of a busy week for President Donald Trump. Star-Advertiser. Vice President Mike Pence's office said he would depart Hawaii on Monday afternoon after meeting with U.S. Pacific Command leaders and troops stationed in Honolulu. Plans for a Tuesday visit to the USS Arizona in Pearl Harbor have been postponed, Pence's office said. Associated Press. Video: VP Mike Pence Arrives in Honolulu. Civil Beat. The fears of a ballistic missile strike on Hawaii from North Korea are overblown, according to U.S. Rep. Colleen Hanabusa, speaking at a town hall in Honolulu Saturday. Civil Beat. 3 judges to hear appeal of Hawaii ruling blocking travel ban. Associated Press. Hawaii public school teachers would see multiyear pay raises totaling nearly 14 percent under a tentative four-year contract deal reached with the state. Star-Advertiser. A crucial vote for thousands of Hawaii's public school teachers is coming up this week. They'll have a chance to learn more about a tentative contract agreement during statewide meetings that start on Monday. Hawaii News Now. After nine months of negotiating, beginning public school teachers across Hawaii could see their salaries jump by nearly $10,000. For the first time by the end of the contract, beginning teachers in Hawaii will be making over $50,000 a year. KITV. Tentative agreement goes to teachers to ratify. KHON2. Corey Rosenlee, president of the 13,500-Member Hawaii State Teachers Association, announced that the HSTA Board is recommending a tentative agreement for four-year contract. Maui Now. Tom Gorak, Gov. David Ige’s controversial nominee to the state agency that regulates Hawaii’s utilities was dealt a preliminary setback Friday when he was narrowly rejected by a Senate committee. Star-Advertiser. A state Senate committee recommended Friday to the full Senate to reject Gov. David Ige’s nomination of current Hawaii Public Utilities Commission commissioner Thomas Gorak. Pacific Business News. A state House-Senate conference committee has recommended final passage of a bill that would budget $250,000 in state money to help fund a physician student loan repayment program for doctors who practice in underserved areas in Hawaii. Maui News. Atmospheric carbon dioxide measurements from Mauna Loa Observatory last week topped 410 parts per million for the first time in modern history. Star-Advertiser. More than 600 students joined activists at the state Capitol rotunda Thursday in support of a bill that sets a goal of having all ground transportation in Hawaii run on renewable fuel by 2045. Star-Advertiser. Lawmakers tussle with bill to fight painkiller addiction. Star-Advertiser. Hawaii lawmakers are still considering several bills designed to make life easier for condominium owners and stem complaints about the boards that oversee their buildings, but some owners say the legislation doesn’t go far enough. Civil Beat. The state’s Senate Judiciary and Labor Committee advanced a resolution Tuesday calling for a national constitutional convention to claw back the U.S. Supreme Court’s controversial Citizens United decision, which has increased the influence of corporate money in political campaigns. Star-Advertiser. Hawaii, last year ranked the healthiest state in the nation, has scored below average in a report measuring public health preparedness — or the ability to respond to natural disasters, disease outbreaks and other public health crises. Star-Advertiser. As state health officials try to balance public education with preventing panic, some critics believe the state should have addressed rat lungworm disease more vigorously earlier. Civil Beat. Commentary: Ige’s administration lacks needed victories. Star-Advertiser. A bill that would allow private sponsorship of city parks and other facilities is drawing the ire of the Outdoor Circle and others worried that it would clear the way for billboards and other outdoor advertising despite the strong insistence by the bill’s author that that won’t happen. Star-Advertiser. Honolulu Commission votes down Haleiwa house lots plan. Star-Advertiser. The wheels on the bus aren’t going round and round for almost half the Hele-On fleet. West Hawaii Today. Hawaii Electric Light Co. and its parent companies, Hawaiian Electric Co. and Hawaiian Electric Industries, are asking a judge to dismiss a federal antitrust lawsuit against them by Hu Honua Bioenergy and compel arbitration of all claims. Tribune-Herald. Hawaii County’s 2017-18 spending plan was hit with a double whammy Thursday, when a legislative conference committee deadlocked on the county share of the hotel tax and firefighters were awarded a more than 2 percent pay increase. West Hawaii Today. Invasive spittlebug attacks Kona grazing land. Tribune-Herald. The Ka‘u Community Development Plan is nearing completion. Tribune-Herald. Not cleared for takeoff: DLNR confusion puts model flying club in holding pattern. West Hawaii Today. Maui surrounded by history. A team of divers is documenting state’s underwater wreckage. Maui News. Signs have been posted warning people against trespassing near a crop of sunflowers on Maui that is being grown as part of an experiment to produce biofuel. A growing number of visitors have been attracted to the yellow flowers that started blooming weeks ago. Associated Press. The Kauai Police Department is requesting nearly $900,000 from the County Council to lease 15 marked patrol Ford Explorers. Garden Island. The gigantic pension plan that serves Los Angeles County government employees is putting up for sale the St. Regis Princeville Resort and Makai Golf Club in Princeville, which have been part of the fund’s assets since 2005. The decision has major financial and other ramifications for Kauai. Garden Island.